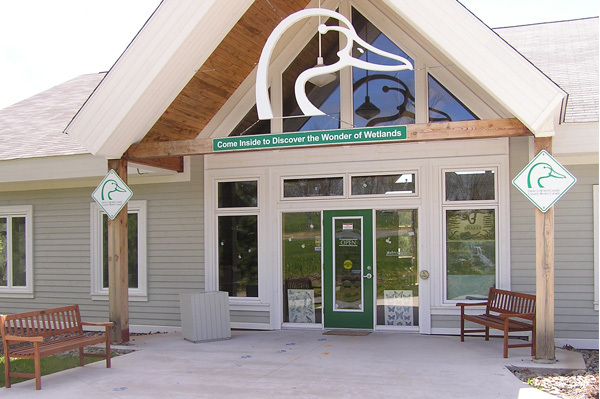 The Wetland Centre in the Shubenacadie Wildlife Park is a partnership between Ducks Unlimited Canada and Nova Scotia Department of Natural Resources, to share the wonder of wetlands and nature with Nova Scotians. The centre offers educational programming and interactive activities like bird-watching and critter dipping. Come watch the eagles, take a walk on the wheelchair-accessible Wetland Trails or a more rugged hike on the St. Andrew’s Marsh Trail. At DUC, we connect people to nature and a healthier world through wetland conservation. We’ve been working hard for almost 80 years to save Canada’s wetlands, which play a critical role in maintaining the health of our environment, our economy and our lifestyle. From wetland restoration to education to science, we’re committed to conserving wetlands, wildlife and wild places for generations to come. In Atlantic Canada, DUC has conserved over 120,000 acres of wetland, including the St. Andrews Marsh right here at the Shubenacadie Wildlife Park. If you’d like to find out more about DUC and our conservation programs, visit ducks.ca.